Francie Mendenhall - Call on Dolly! 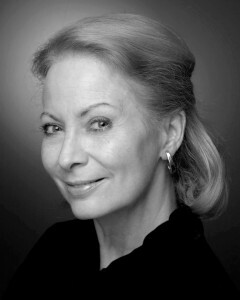 Francie Mendenhall auditioned in Los Angeles for producer Robert Cherin and was hired as a singing ensemble member. 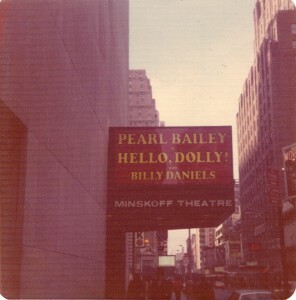 The Dolly company had been on tour and were heading for San Diego then coming back to the Shubert Theatre in Los Angeles before heading out to Boston, Broadway and Washington D.C.
Francie was involved in Dolly from August 29, 1975 until January 24, 1976. This was the Pearl Bailey/Billy Daniels revival. Billy Daniels, was a singer active in the United States and Europe from the mid-1930s to 1988, notable for his hit recording of “That Old Black Magic” and his pioneering performances on early 1950s television. Francie respected Miss Bailey (they never called her Pearl) and got along with her. She would speak to Francie with respect and included her in outings. She had obligations to fulfill during the run of our tour and was generous with the cast bringing them gifts when she came back from serving as a goodwill ambassador. She served as a United Nations’ Goodwill Ambassador under several Republican Presidential Administrations and was dubbed the Ambassador of Love. 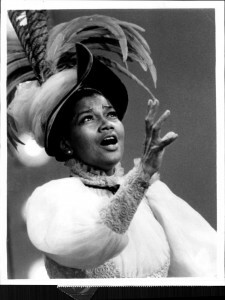 At the end of each show the entire cast would stand onstage while she spoke to the audience and sang. Francine says she will never forget her rendition of “I’ll Be Seeing You”. She was magic. She held a tight rein on the cast, expecting professionalism at all times. I asked Francie about her thoughts on Gower Champion. Her thoughts are that he was an extremely gifted inventor of dance. Francie never met him but is thrilled to have been in one of his productions. Francie really enjoyed her entrance at the top of the show in “Call On Dolly”. The syncopated steps and great vocals were a joy every show. It was also Miss Bailey’s entrance and the audience loved it. She really knew how to take stage. “Put on Your Sunday Clothes” was wonderful with thrilling gorgeous harmonies and a richness that makes the heart soar. Francie loves the score and “Before The Parade Passes By” is the star of the score in her opinion. Francie opened along with the other newbies on August 29, 1975 at the San Diego Civic Center. She felt prepared, loved her costumes and was very ready. Francie’s put-in rehearsals lasted three days with conductor Al Cavalier and the ensemble. She was hired along with several other singers. They had many opening nights, one every time the company moved to another city. They were always exciting for Francie. Experiencing a new theatre, orchestra, meeting the new local crew and the dressers was great. Much of the enjoyment for the actors is the audience of course and the anticipation of seeing how they would respond in each city was fun. Here is a favorite memory of opening night from each city! The stage manager met Francie at the theatre and took her to Miss Bailey’s dressing room before the show to meet her. Miss Bailey remembered seeing Francie sing a solo in Vegas when she (Francie) was with the Dean Martin Golddiggers and they were opening for Tony Bennett at Caesar’s Palace. She was nice. Francie was happy to be rehearsing and getting the show under her belt before opening in Los Angeles and getting to know the existing Dolly cast. The Shubert in Century City was glistening, very modern and beautiful. 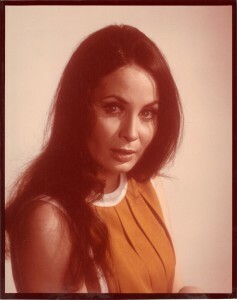 It was an especially exciting opening in Los Angeles for Francie because she lived there at the time and friends and family came to then show. Opening in Boston was exciting. They had a delay because their sets hadn’t arrived on time and they were told to sit tight. When the sets weren’t showing up, Miss Bailey asked the help of her friend Betty Ford who dispatched the FBI. Turns out there were some scab drivers who’d left the trucks on the side of the road. The trucks were retrieved by the FBI and the sets went up, hence an opening night! Wow what a beautiful theatre the Shubert in Boston is. You could almost touch the audience. The one thing Francie learned from being in this company that she still carries with her to this day is how a family of friends is formed from your fellow cast members that lasts a lifetime. Here is Francie’s worst experience with the show: Mrs. Malloy played by Mary Louise, fainted onstage just before Ribbons Down My Back while they were playing the Minskoff in New York. They were all horrified. As Francie recalls the lights dimmed and an announcement was made. Francie’s friend and roomy sometimes Pat Gideon was the understudy and ready in a flash (her first shot at the role) when Miss Bailey decided to go on and sing the song herself. She made a costume change needed for her next entrance as Dolly Levi behind something onstage while singing. Miss Bailey played her role and Mrs. Molloy for the rest of the show. Francie doesn’t remember many of the details that night. She does remember though the disappointment of her friend though and Mary Louise. Poor Pat. She was devastated and overcame that. Mary recovered well. She feels that Jerry Herman is fabulously gifted. She would love to perform in all of his shows. She loves Carol Channing and loves hearing her sing the show. The original cast was superb all the way around.